I am embarking on some new work this winter, in a domain that continues to intrigue me. En darken is an enquiry into the human implications of the disappearing phenomena of darkness. How might performance, specifically dance practice, reveal the darkness as ecological resource? and how might an ecology of embodied practice be developed as a resource that allows the human species to reconsider its perceptual and physiological enmeshment in the domain of nighttime? 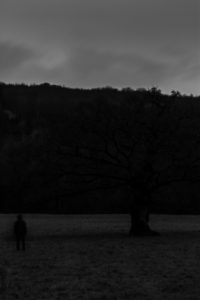 In rural west Wales, where i live, there are places where the darkness has a material form, and can be experienced directly. Encountering the darkness here invites other ways (some ancient) of being in a place at night time. This research develops physical practices that invite engagement with dark places, moving towards an embodied, transferable knowledge of exploration and the experience of community. At present this physical research is happening close to my home in Abercych and in Tycanol, n ancient sessile oak woodland in north Pembrokeshire. There will be a short residency at the Manorbier Reading Room between 25-28 January to explore and develop movement practices and drawings, with a public sharing on sunday 28th.